Mining | Resource Systems Group, Inc. The mining industry often presents noise and environmental impact challenges, but it also creates opportunities for new markets and efficiency investments. 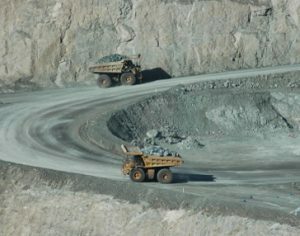 RSG is experienced working with clients to estimate and monitor noise and traffic impacts, develop noise mitigation plans, and conduct air quality studies of direct and fugitive sources—including diesel motor combustion, crushing, screening, and conveying—from surface mining, quarries, and gravel pits. RSG also conducts traffic studies to evaluate changes in traffic congestion and safety around mining sites. These assessments allow our clients to make confident decisions around noise- and emission-reduction initiatives and traffic control plans to ensure compliance with environmental regulations and zoning ordinances. In addition, we provide expert testimony in noise, air, and traffic impacts from mining projects in courtrooms, quasi-judicial hearings, local planning/zoning hearings, and public meetings.